Can you tell I'm on a "comfort food" kick lately?? This is a family favorite and a dish I was introduced to after moving to the South. 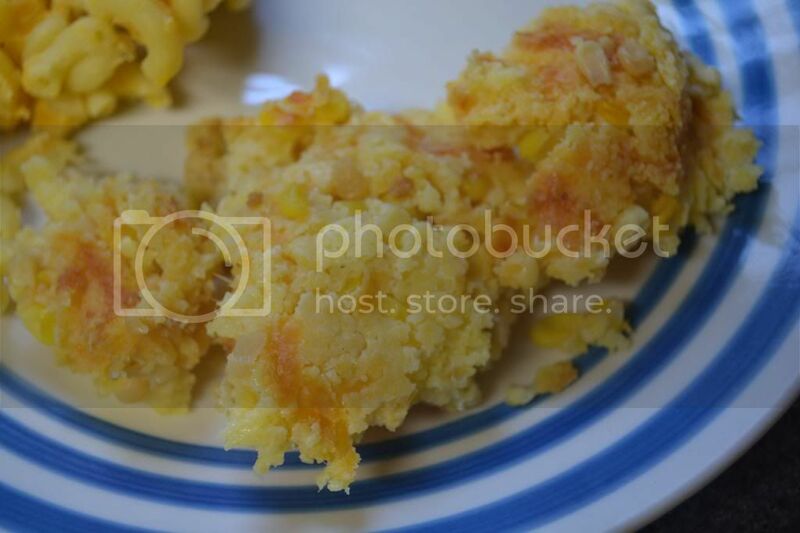 It's super simple and very yummy - if you like cheesy, bready, corny kinds of things! :) It kind of reminds me of a pudding in texture - especially if you stick to the shorter baking time (I prefer it to be a little browned on top, but mostly soft still). I put everything directly in a 9x13 baking pan and combine in the pan, smooth with a spatula and bake. We had this a couple nights ago with some delicious steaks using the Best Steak Marinade in Existence and Homemade Macaroni and Cheese! Yum! Put the stick of butter into the 9x13 pan and allow it to melt while the oven preheats to 350 degrees. Remove pan with melted butter and add in the remaining ingredients, gently stirring with a spatula until evenly combined and smoothed out. Bake for 45-60 minutes in preheated oven.